Few of the Tagalog words that I learned when I first arrived in the Philippines was Pancit and pusit. Pancit is easy for me to remember as it goes with another word Canton. I speak Cantonese so the word Pancit Canton easily stick to my mind. 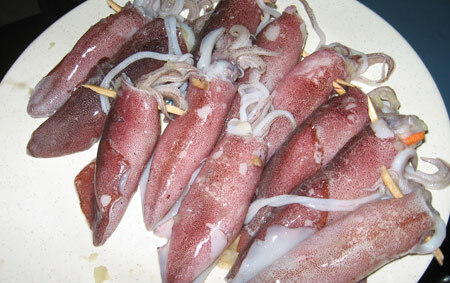 The other word Pusit ( squid or calamari ) sounds like Pancit. Sometimes I do get it mixed up and ended up calling the must have Filipino birthdays dish Pusit Canton. My Pinoy friends would laughed at me and corrected my blunder. One time when I was in a Chinese restaurant in Malate, I saw this calamari dish on the menu called Calamari with Salt and Pepper. Suddenly I have a feeling that I will never forget the Tagalog word for calamari. I just put the words “Pusit Some More” together as it reminded me of a popular 90’s song by Salt and Pepper “Push It Some More”. I am sure those of you who are actively involved in the disco scenes in the 90’s are hearing the tune in your head now. Few weeks ago, I made a dish named Begedel and it gave me an idea to use part of the concept for my stuffed calamari dish. So here are the steps on how I made my calamari dish and I shall name it “Pusit Some More”. The hardest part for me when making this dish was stuffing the filling into the slippery calamari. I have to admit that this is my first attempt in making this dish. The result was pretty good but I wouldn’t rate this as my best dish on first attempt. My batter wasn’t thick enough and it did not really coat the calamari as much as I would like it to. Maybe I should have dried the calamari by covering it with very thin layer of flour to make it dry. 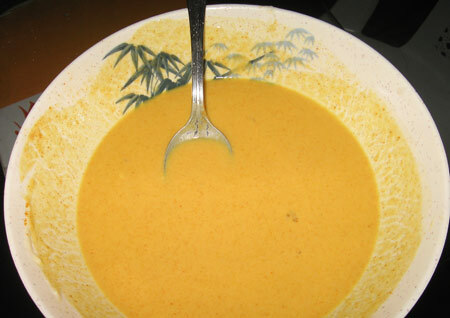 I am sure my second attempt would be better and I can get 3 different kind of texture from this dish. 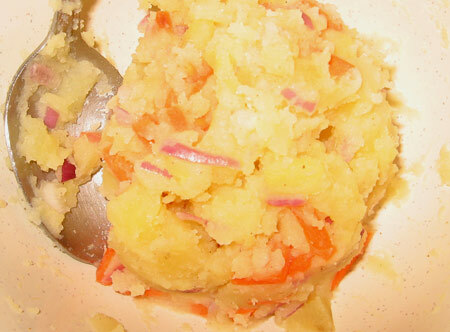 Crunchiness from the batter, spongy and rubbery from the calamari and soft and easy from the mash potato. 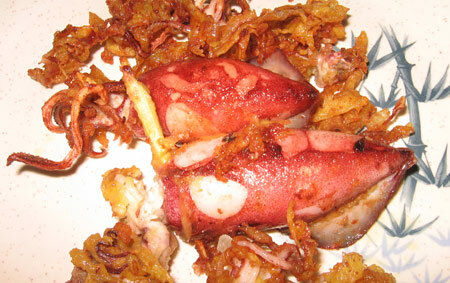 The curry powder will give a very nice taste to this Pusit Some More dish. and the squid looks nasty, like you found and slaughtered a baby alien then cooked it with little fried crunchies! This is the thing we gotta work on Z-Man. To train you to eat 100% like an Asian dude. If you can love namprik, I have faith in you. We shall start with the baby alien dish! Squid by nature is tough, even in the raw form. Best way to do it is to cook with high heat and not for long. It does get cooked real fast though. 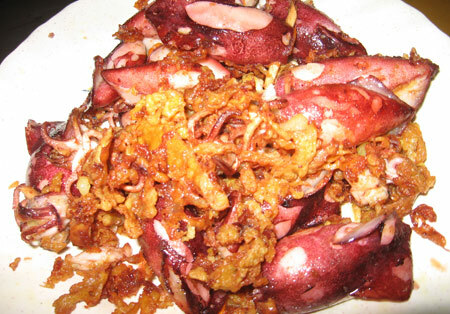 If some dishes that requires the squid to be cook a long time ( adobong pusit ), I suggest you cut it into smaller pieces.